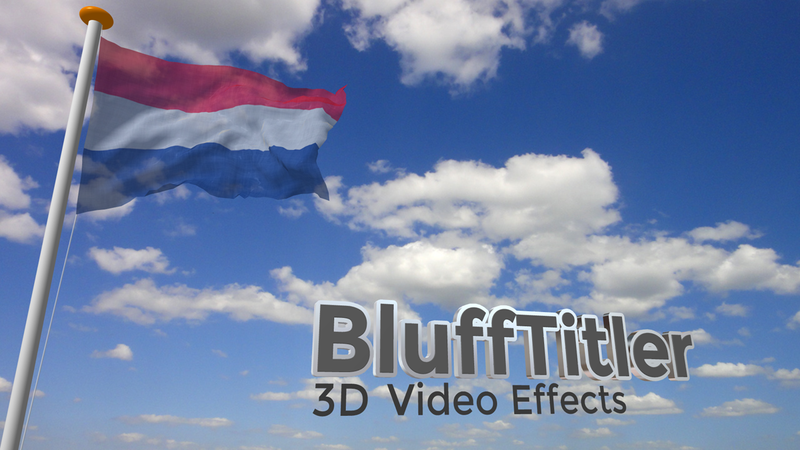 The flag in the above screenshot is rendered with the waving flag layer. What can I do with the waving flag layer? With the waving flag layer you can render a waving flag. How do I create a waving flag layer? Choose LAYER > Add layer > Add waving flag layer... to create a new waving flag layer. The new waving flag layer can be selected from the layers dropdown to make it the active layer. The installer comes with shows demonstrating the possibilities of the waving flag layer. Choose FILE > Open show... and select a show from the BluffTitler/Media/Shows/Wavingflag folder. The waving flag layer is simulated using a mass spring damper model. In this model the vertices of the cloth model are connected with springs. The cloth simulation is not deterministic. The flag is not reset when you start playing/exporting and the wind noise is random so the cloth looks different every time. It takes a few simulation steps before the flag hangs realistically. To prevent this initialization time to appear in your exported video when using a playlist or server rendering, you can use the Pre-export simulation time option int the FILE > Show properties... dialog. Mirrors the back of the flag. This style can be handy for flags with texts. The cord is sewn inside the flag. This style can be handy for transparent flags. The position of the flag. The rotation of the flag. The size of the flag. The colour of the flag. The specular colour of the flag. The transparency of the flag. The direction and size of the wind force. For realistic behaviour, prevent using 0. For example to make the flag wave to the right use (2, 0.1, 0.1). And to make it hang down use (0.01, -1, 0.01). Without some noise, the flag will eventually hang still. Use the noise property to keep it alive. The elasticity of the flag. The air damps the movement of the flag. Use a higher value to make it less flappy. The radius of the pole. This is used for collision detection. The 1st slider controls the top, the 2nd the middle and the 3rd the bottom. The vertical position of the flag. The length and radius of the cord. The colour of the cord. With this property you can define the maximum size of the flag. This is important for templates that must render flags with different dimensions correctly. Press <F2> to display the bounds.